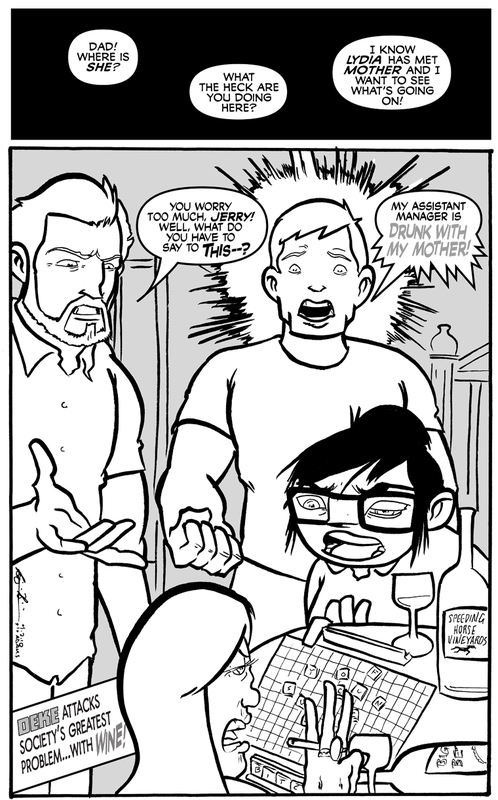 The Rack: A Comic Strip About A Comic Shop - The Shocking Truth About Wine! The Shocking Truth About Wine! Yup! That’s (almost) the world famous cover to Green Lantern #85. I wonder what’s going to happen in Green Lantern vol. 2 #85? Larfleeze wants the one thing he CAN’T get. LOVE! Let’s hope that fate is kinder to Deke, Jerry, and Lydia. What will bring peace to a troubled world? Two words: Drunken. Scrabble. Gail’s working on quite the triple word score there. Actually, Kyle fought some monsters, shirtless, with totally metal bone swords. Actually, that IS GL vol. 2 #85. Kyle’s run was vol. 3, and the current one is vol. 4. Thank god people like Pete and Tim are there to catch us when we fall. Pretty great stuff, man. Lydia has the advantage cuz she can make words like chow and ching and wong and such. And then add the scores better. Huh, before I typed this stuff the concept seemed so together. Have you seen my better work? Lydia has the advantage cuz she can make words like chow and ching and wong and such. Freed of the context of the earlier strip, that looks pretty freaking racist, John. Aw, man. I drew a swipe of that same cover not a month ago. I guess Speedy’s smack habit has been on a lot of minds lately. Comic nerds–remembering unimportant minutiae so you don’t have to since 1939.